Love is when the happiness of others become more important than your own. This is why Moodhu Holidays, a leading travel agent in Maldives, has launched Moodhu Gift Voucher. Do you often wonder what to buy for a newly wedded couple? A family member or for your best friend’s birthday? For any other special occasion of any other special person in your life? We all do! Moodhu Gift Voucher is the perfect and most convenient solution, as various forms of rejuvenation are a must for the human body to go on living. And many would agree, the most effective way is a holiday! Maldives holidays are amongst the most expensive in the world, but they have been made affordable by Moodhu Holidays for locals. 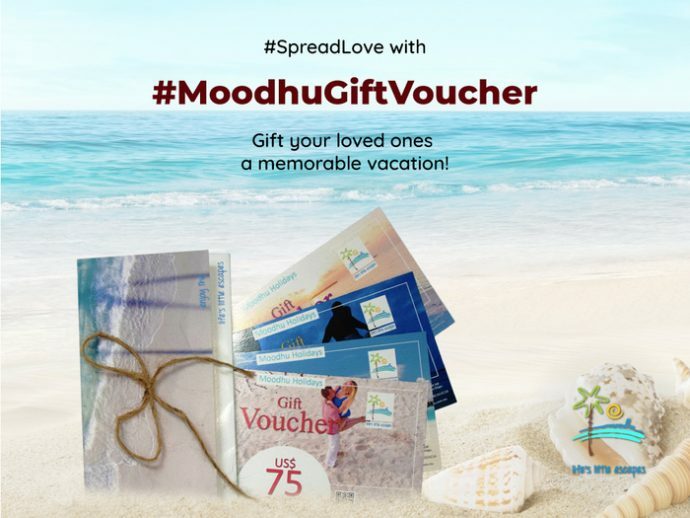 With Moodhu Gift Vouchers, you can gift a holiday to your loved ones. Each Moodhu Gift Voucher will have a unique serial number and is sealed in a beautifully printed envelope. Moodhu Gift Vouchers come in denominations of USD 50, 75, 100 and 200, and can be redeemed only once at any time. Moodhu Gift Vouchers are available for purchase at Moodhu Holidays Maldives head office from Monday to Saturday during office hours (8am to 5pm). You can reach them on (+960) 7907795 / 7987794 (WhatsApp, Viber or Telegram), through any social media platform, or online chat from their website.